I am fortunate when it comes to broccoli. Not only do I live in an area where I can grow broccoli fairly easily (broccoli grows in most zones), but both my children love eating broccoli. So as you can imagine, having my kids involved in planting, cultivating and harvesting broccoli is an easy task. Broccoli uses a lot of nitrogen from your soil, so in order to make sure the area where you plant your broccoli will be adequate, be sure to add plenty of shredded leaves and grass clippings in the previous fall. That means right now! I like to start my broccoli from seeds indoors about three to four weeks prior to the final frost in my area. You can always locate your frost zone from the new and enhanced USDA Plant Hardiness Zone Map on the USDA website. I use a homemade potting soil to start my broccoli seeds in. It is a combination of equal parts compost and peat and I mix in just a little perlite. I use to add in equal parts of all three, but I found the perlite in such a large quantity is really not necessary. Once the fear of frost is gone, I will transplant my broccoli plants to their permanent location in my garden where I know they can get full sun, although broccoli will still do well in partial shade. I space out my broccoli plants about sixteen to eighteen inches. Broccoli plants can get fairly large. In a square foot garden, you might be able to get away with one square per broccoli plant, but that may be a bit tight. 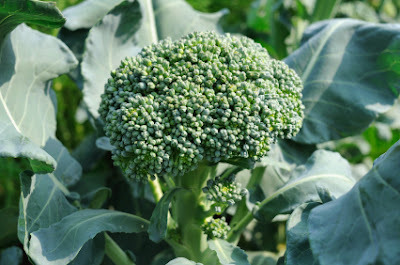 Fertilize your broccoli plants every couple of weeks with a quality organic fertilizer. I tend not to use synthetic fertilizers. The choice is obviously yours. Fish emulsion is an excellent source of fertilizer for your broccoli plants. You will know it is time to harvest the large head of broccoli, when it is dark green and firm. If you start seeing yellow in the buds, your broccoli is starting to over ripen. You will want to harvest your broccoli as soon as possible. Just because you harvested the entire head of broccoli does not mean the broccoli plant is done. Throughout the course of the remainder of the season (at least a few more weeks in most areas), your broccoli plant will grow small shoots of broccoli which can be harvested and thrown into a salad for a nice fresh treat. Swiss chard is such a great vegetable to add to your home vegetable garden. Swiss chard can be used in so many different dishes, and while it may taste a slight bit bitter (to me anyway), when eaten raw, Swiss Chard has a tremendous amount of flavor. Mix in the many varieties of Swiss Chard that you can grow, and the possibilities are nearly endless. Swiss Chard comes in all shades of the colors of the rainbow. In fact there is a variety called Rainbow, and another called Bright Lights that will have your Swiss Chard popping up in all kinds of color. But enough about how cool Swiss Chard looks growing in your home vegetable garden. Let’s talk about how you actually grow Swiss Chard. Swiss Chard seeds are not too large, but not very small either. You can get away with planting Swiss Chard seeds a half inch deep. Your Swiss Chard will produce plenty of energy to push the growing young plant through the surface. Start your Swiss Chard seeds indoors, in a greenhouse or in a cold frame, where the warmth will help your Swiss Chard seeds germinate faster. Under optimal conditions you can expect your Swiss Chard seeds to germinate in five to seven days. 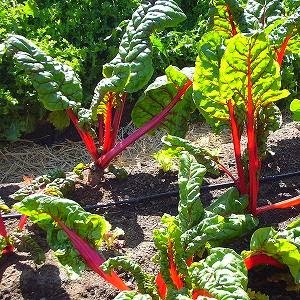 Once your Swiss Chard has germinated, and fear of frost has subsided in your area, move your Swiss Chard to your outside vegetable garden. Space out your Swiss Chard plants eight to ten inches. You want to give their roots plenty of room to grow. As a side note, Swiss Chard makes a great companion plant to members of the cabbage family as well as lettuce, but not so much to beets or spinach. Swiss Chard, like many other leafy vegetables, will do best in full sun, but produce well in a shaded environment. Be sure to give your Swiss Chard a moderate watering not letting the soil get too dry. When the Swiss Chard leaves are near eight inches, they are ready to be harvested. Simply cut the stalks of your Swiss Chard plants about an inch above the soil to harvest. Your Swiss Chard plants will continue to grow when you do this. Swiss Chard is rich in vitamins A, K & C, containing a great deal of the recommended daily consumption (214%, 716% and 53% respectively). You might be asking yourself, why is he writing about asparagus now in the fall. Isn’t this something better for the spring? On the surface, writing about how to grow asparagus in the spring time might be a better fit, however, growing asparagus begins with proper soil amending in the fall. I’ll explain that in a little bit. Asparagus can be prepared for consumption in so many ways and in fact asparagus does not have to be prepared at all, as asparagus tastes great freshly clipped from the garden. This perennial garden vegetable has but one draw back. When asparagus is grown directly from seeds, it takes about 3 years before it reaches maturity. While that might seem like a long time time, not to worry, asparagus has a lifespan of up to 20 years, although 15 is more likely. Back to why we should prepare our asparagus in the fall. 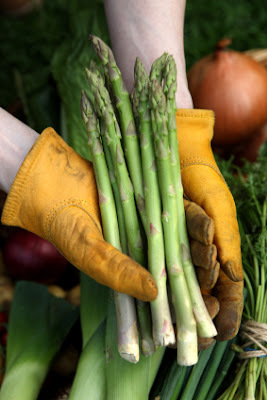 Asparagus loves acidic soil, and loves the soil to be loose down to as deep as eighteen inches. By continually working in compost in the fall months, your soil will be ready for asparagus in the springtime. If you do not have 3 years to wait for asparagus to reach maturity, then you can always purchase asparagus crowns from a local home or garden center. You can usually get about a half dozen for just a few bucks. Well worth the investment. Just keep in mind, a part of your garden will be dedicated to asparagus for the next one to two decades. So choose your asparagus spot wisely. Asparagus grows best when it gets eight hours of sunlight daily, but will do well in the 4 to 8 hour range. Asparagus loves water, so be sure to give them a good watering as often as possible. If you are starting with seeds and plan to direct sow them into your garden bed, be sure not to plant them deeper than a half inch. If you are using asparagus crowns, then you should plant them eight to twelve inches deep. And regardless of whether you are using seeds or crowns, space them out at least eighteen inches. Your asparagus will spread to a degree. Mary Washington and Jersey Hybrids are the most popular varieties, but there are a whole slew of choices out there. Your asparagus will have a big need to be fertilized. This is due to the fact they are perennials. To make sure you are feeding your asparagus properly, feed it a steady stream of compost, and/or compost tea, throughout the year. It is important to keep your asparagus beds weed free. To limit the amount of hand weeding you are going to have to do, I recommend laying down a few sheets of newspaper around your asparagus and covering with straw mulch. You will always have to hand pick some, but at least this will keep it to a minimum. To make sure your asparagus makes it through the winter, cut back the ferns, throw them in your compost pile, and layer on some compost and straw. By year 3 you should have nice, thick stalks of asparagus ready to be eaten. Asparagus tastes great if consumed within 30 minutes after harvesting. 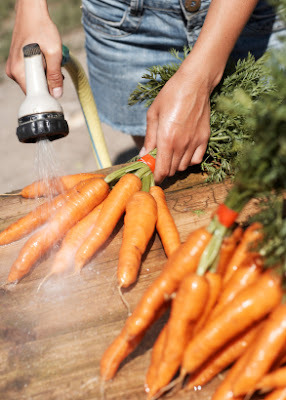 Regardless of where you stand on using chemical based bug sprays, one thing's for sure, and that is, if you do not keep the harmful insects off your fruits and vegetables, you won’t have much to harvest. Me personally, I do not like to use any bug sprays made with chemicals. It just makes me feel uncomfortable to spray the food, me and my family is going to eat. What I have learned, over the thirty plus years of gardening, is that you can make your own sprays at home, that can definitely help. One thing that has been common when searching for solutions to repel bad insects, is that hot pepper is always the number one ingredient of any home made bug spray (most of the time, some web sites differ). The active ingredient in hot peppers is capsaicin (chili peppers actually). Capsaicin will create a burning sensation when it comes in contact with human tissue, so be careful when creating your spray. As with any spray, you will need to reapply after rain or watering that could wash your homemade spray away. As a note of caution, use care when creating any hot pepper based spray as it can irritate your skin and eyes. So wear protective eyewear and gloves when needed. In a pot on your stove, add in seven crushed garlic cloves, one tablespoon of powdered cayenne pepper and three cups of water. Heat up mixture, stirring to completely to combine the ingredients. Try not to bring the mixture to a boil as that is not necessary. Set the mixture aside for forty-eight hours as to allow the ingredients to combine. Once combined, add mixture to a hand held spray bottle and begin spraying your plants as needed. Just remember to wash your fruits and vegetables thoroughly prior to consumption.